Having a lovely receptionist to supervise your clinic is not enough. With most dentistry clinics, reception staff are also dentist assistants who are required to frequently move back and forth, inbetween and during procedures, to serve customers or visitors at the front desk. That is why most dentist clinics use CCTV surveillance to effectively assist all dentists and staff in monitoring visitors during times when the reception desk or waiting room area is unsupervised. At Serious Security, whether your dentistry clinic is a one man band or a clinic of more than 3 dentists; located within a commercial building or running from a home clinic; we have the right security solution to help you effectively monitor your patients as well as monitor areas that are difficult to supervise during patient check ups or procedures. 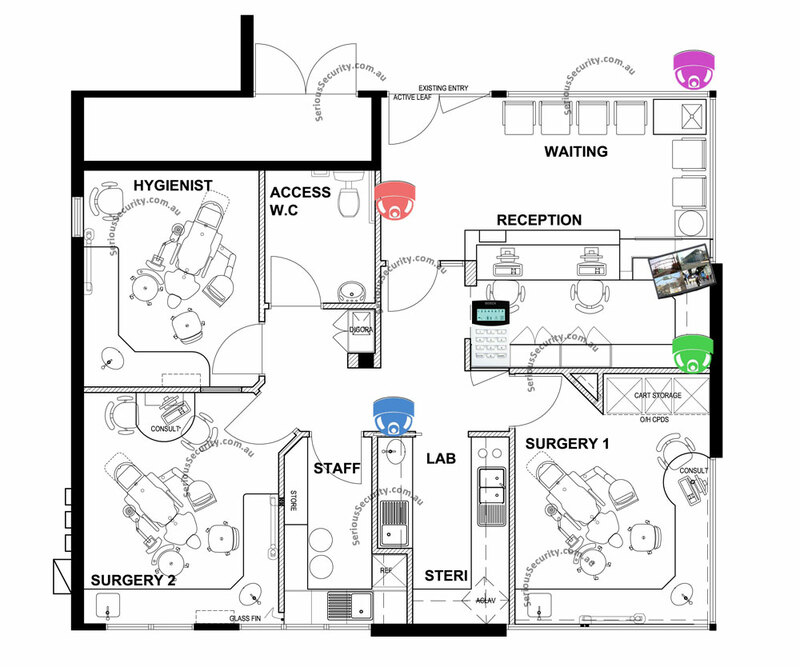 The dentistry clinic floor plan below is a common example of how most dentists choose to set up their security equipment. An analog CCTV system is usually quite sufficient in helping dentists monitor their clinics. This will allow enough resolution to monitor incoming and outgoing patient traffic as well as recognise facial features. However, if you feel your clinic requires more clarity in capturing detailed descriptions on camera, you will need to upgrade to our high definition IP network camera system. While most dentists are busy treating their patients, it is difficult to keep an eye on patient activities in the waiting room or visitors who may wander into unsupervised areas of the clinic. That is why, it is important to discuss vulnerable areas within the clinic with our team so we can position your cameras correctly right from the beginning to allow maximum view span in those areas. For some clinics, there may also be an outdoor parking area. Installing an outdoor CCTV help monitor vehicle traffic and other unsavoury behaviour that may occur on your premise.